The Luxe master bath in the Hawthorne design by K. Hovanian Homes. Bathrooms are often considered the most used rooms of the house. However the master bath doesn't usually fall into that category. The master bath is typically reserved solely for the use of the homeowners themselves and, as a result, is most often a room for pampering and luxury, as opposed to a utilitarian room of necessity. Master baths remain one of the most sought-after features in new homes, as they provide homeowners with a truly private oasis within their own home. Our featured master bath takes luxury and privacy to a whole new level, while still meeting the practical needs of the homeowner. This home is located in the Sterling Ranch single-family home development in Davie, FL., very close to Fort Lauderdale. 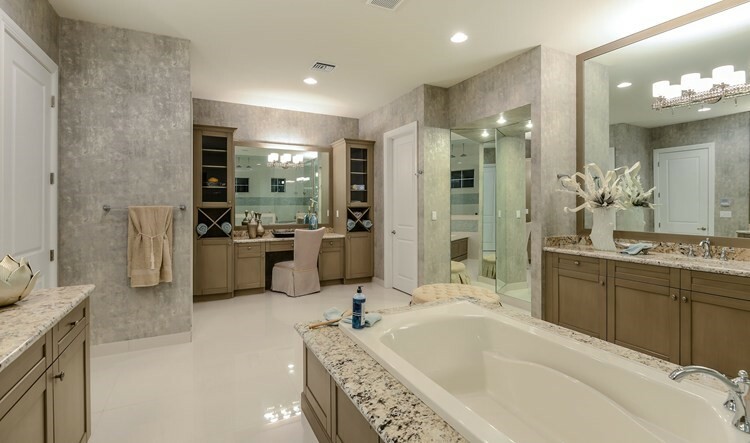 This master bath is featured in the Hawthorne design by K. Hovnanian Homes, a new home builder with developments in 15 states. The Hawthorne is a 4,000+ square foot, one-story, single-family home with four bedrooms, three-and-a-half baths, and a three-car garage set on a half-acre home site. The master bath is located in the Owner's Suite section of the home, which provides plenty of privacy, space and did we mention, ultimate luxury! The first thing we noticed about this master bathroom is the size. It is enormous; nearly the same size as the 24' x 17' master bedroom and that is not including the two walk-in closets! This master bath is a combination bathroom, powder room, dressing room, and spa, providing plenty of space for two people navigate at the same time. It is a true "his and hers" bath, not only because of the dual sinks and dual toilet closets, but because two people can both use the area at the same time without ever getting in the others' way. It is so spacious and thoughtfully laid out that it really could be considered two entirely separate baths. This master bathroom has a lot going for it. It is spacious and modern without feeling cold or impersonal. The functionality is phenomenal and the fact that there is only one way into or out of the room (through the master bedroom) makes it a truly private space. Spacious and Open Floorplan. The size of the master bath means plenty of space for all of the necessities – tub, toilets, sink, shower, vanity, storage. The fact that there are two toilets, two sinks, and two entrances to the dual shower only makes the size of the floorplan even more apparent. The layout itself is highly unique. Most master bathrooms are designed in a galley style; this one is more of a reflected galley style. Each side of the room completely mirrors the other. Superb Functionality. Again, the size and layout of this master bath creates exceptional functionality. It is truly a "his and hers" style bath. Separate toilets, separate sinks, separate vanities make getting ready in the morning a breeze. The dual shower is extraordinarily long and accessible from either side of the spa-like tub. A third vanity opposite the shower provides a convenient space to put the finishing touches on makeup without getting in anyone's way. Modern Style and Design. The color scheme has a light and airy feel to it and the mixed used of colors, textures, and materials is very modern. Light-colored floors work well with both the granite countertops and textured walls. The unique greyish-brown cabinetry is the perfect bridge connecting the different colors found on the walls and countertops and even the white doors to the toilet closets work; they make the toilet closets almost appear to recede from view. The crystal touch on the mirror lighting elements add a touch of elegance and femininity. Enormous Size. Yes, we've already mentioned the size, but it is worth repeating. This bathroom works so well because it has enough space to do everything. In a smaller footprint, including all of these elements wouldn't work as well; the room would feel cramped and confining as opposed to open and luxurious. Seamless Storage Space. It took us several looks to realize just how much storage space this bathroom has, because the storage space within the custom blends so nicely with the design. It provides much-needed storage but doesn't scream bathroom storage. It is as much a décor element as a storage necessity. The Shower. What can we say about this shower, except, "Yes please!" It is easily double the length of traditional showers and we really like the fact that it is long and narrow as opposed to a large rectangle. The size makes it easier to reach for soaps and shampoos, but it still offers dual functionality. It actually offers three different types of functionality; there are three rain showers centered in the ceiling, a handheld showerhead on one end and an in-wall showerhead at the opposite end – everyone's favorite type of shower is covered! The handheld option, coupled with the pivot doors and shower seats, and the fact that this is a single-story home make the shower easily accessible for those with limited mobility too. 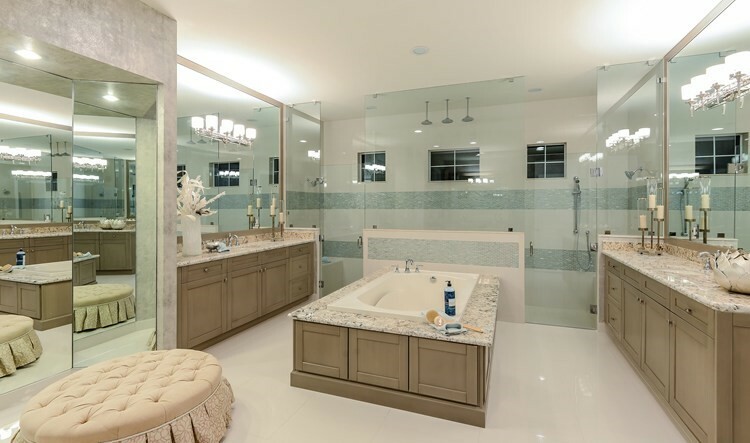 As impressive as this master bathroom is, there are plenty more to explore at HomLuv! Get started today – we guarantee you'll fall in love with several master baths and will move this in home feature to the top of your "must have" list! Liyya Hassanali is a Project Manager and Content Strategist for Kinship Design Marketing, a boutique agency that provides marketing strategies and content for architects, interior designers, and landscape designers. She is a 15+ year veteran of the marketing and advertising industry, working closely with her clients to provide written content that supports their brand.